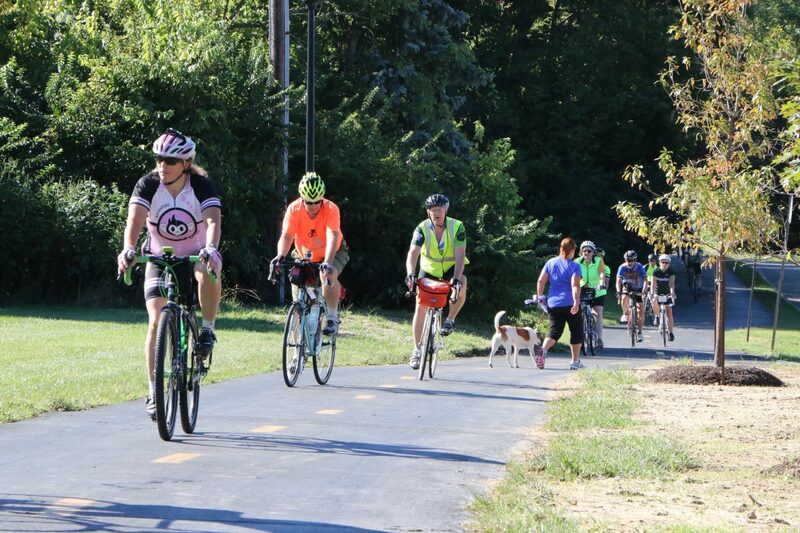 Whether taking a morning hike, early afternoon ride, or multi-day trip across the state, you can use this area to plan your adventure on the Ohio to Erie Trail. Use the resources below to find trailheads, bicycle shops, food stores and restaurants, and lodging options, as well as determine the distance between locations. Our set of four detailed OTET Tour Guides make your trip planning easy. We have two options – Northbound or Southbound guides. Please pay attention to which option you are ordering so you receive the one you want. The entire 326-mile route is divided into four regions with very detailed direction guides. The tour guide is a very detailed set of four maps printed on four sheets of paper that are 8¼ X 25½ and folded to make six panels. All four sheets arrive in a custom plastic envelope making a neat and easy to use navigation kit. Each panel contains a map, mileage and a written description of the trail sections and road routes. The tour guides have been designed to provide straightforward, user-friendly information. Call us for orders of 5 or more at one time. You can order the tour guides for by visiting our online store. Tour Guides at Bike Shops – Several partner bike and coffee shops along the OTET sell the OTET Tour Guide mentioned above. The shops sell them for $15. The participating shops are listed on our Friends Along the Trail Page and the list is expanding. The number of miles that the OTET is routed onto city streets and rural roads is decreasing and we have worked with local entities to make sure that we have chosen the safest street/road route when there is no other choice. Currently there are approximately 53 of the 326 miles or 16% in this category. In some urban areas like our three “C” cities (Cleveland, Columbus and Cincinnati) street routes may be greatly diminished but never completely eliminated. The link in this section will take you to a pdf document that contains the current street and road listings and mileage by OTET region as of February 2019. Listed are attractions, services and amenities (food, lodging, camping, restroom and water) that can be found along and in close proximity to the Ohio to Erie Trail. The attractions and campsites list is listed according to the four sections of the OTET Trail Guide. The amenities list begins from the north (Cleveland) and proceeds south to Cincinnati by county. Within a town, the various services available are listed along with approximate mileage from the trail, directions, website and phone number, if available. Due to ever evolving changes in amenities this list may contain inaccuracies. Please be an advocate and communicate changes via our email address, OhioToErieTrail@gmail.com. In addition to these resources, we have listed the links to journals and a camping map posted by people who have visited the Ohio to Erie Trail and wrote about their experience. See the list on our Facebook Page under Notes. We have a growing presence on CycleLifeHQ and we offer specific details on our Destinations and Itineraries page. The link above takes you to the Friends of the Trail page where retail and lodging establishments have posted their discount services or products that are available to trail users. Be sure to tell them you are a trail traveler to receive the listed offerings. Listed are those bicycle shops that are in close proximity to (either along the Trail or less than 2 miles away) the Ohio to Erie Trail, in order from Cincinnati to Cleveland. In some cases it is best to call the shop for specific directions in the urban areas. The list is aligned with our four map set. The list gives you which map and which panel on the map where the bike shop is located. We have provided name, address, telephone number and made comments to assist you in locating the shop. If you use a bike shop by locating them on our web site listing, please tell the bike shop how you found out about them. In addition to these bicycle shops, we will be adding hardware and other stores where repair parts can be purchased. Find one: let us know please. This is list is a work in progress so email us if there is an addition or correction that should be made to assist travelers. Roadside assistance for AAA members now automatically supports them on their bicycles at no extra cost and no additional sign-up. The only restriction is that the bike fits a traditional bike rack. The towing mileage works the same as vehicle towing mileage: Classic 3 miles; Plus 100 miles; Premier 100 miles and one 200 mile tow. 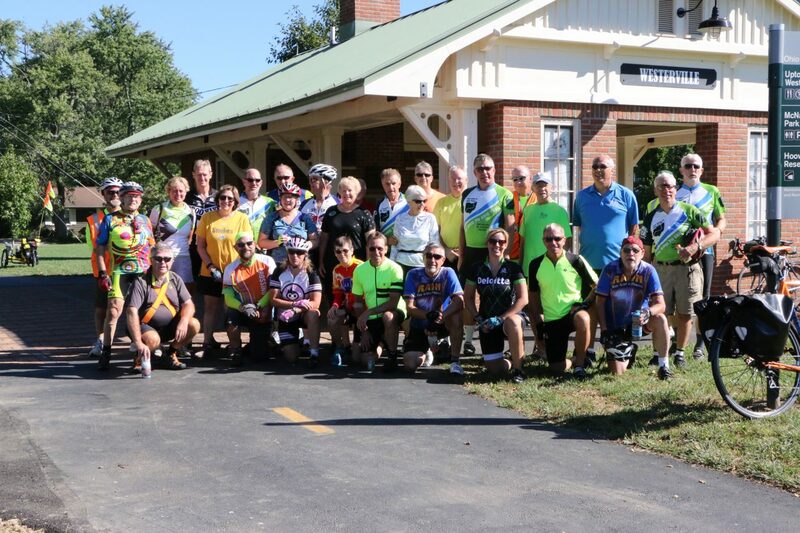 Check out all details at the AAA web site and carry that AAA card on the Ohio to Erie Trail! Use our listing of Bicycle Shops on the OTET as well. Note that not all AAA offices offer the National AAA bike support program. There are two ways to get from the CVG (Cincinnati/Covington Airport) in Northern Kentucky to downtown Cincinnati. The best is the Transit Authority of Northern (TANK) which utilizes bike racks on the front of the buses that do come to the airport on a frequent schedule every day. One can visit these web sites for more info and call 859-331-Tank. The Cincinnati terminal is right at Riverfront and the start of the OTET. No fee for bikes and rider fee is nominal. Riders connect bikes to rack but no locks are permitted. 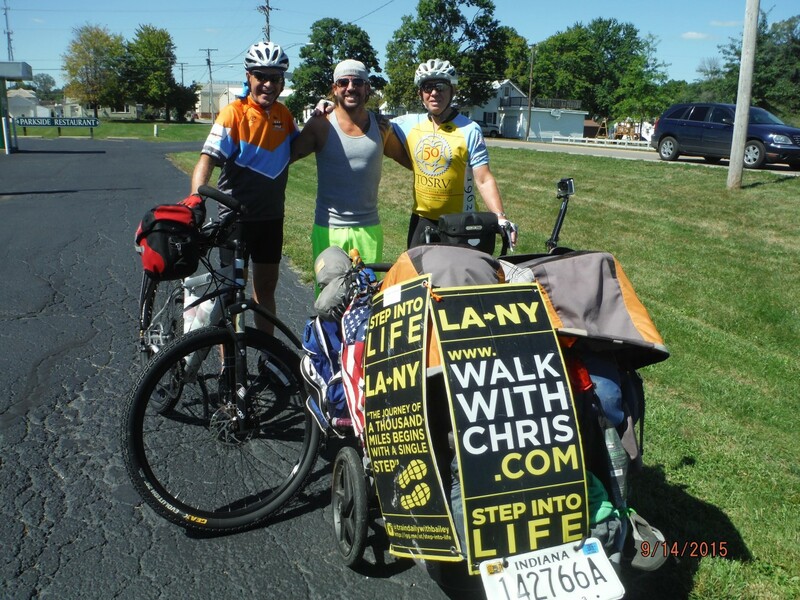 The second way is to ride your bicycle from the airport to Cincinnati on streets for a distance of about 12 miles to the start of the OTET. Take Terminal Drive and Airport Access (only road leaving the airport) north to Petersburg Road (KY20) and follow it (one mile) to KY8/River Road on the Ohio River (2 miles). Follow Route 8/River Road to Newport where you can cross the Ohio River easily on the Purple People Bridge (Newport Southbank Bridge that is PURPLE!). After crossing the Ohio River, you are on Pete Rose Way just a few blocks from the Ohio to Erie Trail along the river. Note that KY8 winds its way changing names as it comes to Covington then to Newport. It changes from River Road, to Highway Avenue to Crescent Avenue through Covington, KY then uses West 5th Street all the way to Monmouth Street in Newport where you turn north (left) towards the River. In three blocks turn right on 3rd Street and the Purple People Bridge will be on your left over the Ohio River. Investigate The Adventure Cyclist Association’s route map for the Northern Tier. The Section 9 map for the Northern Tier includes the route from Cleveland to Orchard Park, NY. The primary wind direction over much of Ohio is from the southwest, as measured at National Weather Service sites at larger cities. Some variability occurs but most weather stations report long-term average winds from a direction between south and west-southwest. The wind can blow from any direction on any given day however, primarily due to Ohio’s location with respect to the position of large high pressure areas and storm systems that are continually moving across the continent. The average daily wind velocity around Ohio is approximately nine mph. Wind velocity varies however by season and location, being faster in winter than in summer and faster in the northern half of the State than in the southern in any given season. Specifically, higher velocities average 12 mph in winter in the north while lowest speeds are six to eight mph in summer in the south. Local Area Contacts MORE TRAIL RESOURCES and more Camping resources. Listed by region are the web contacts for organizations and communities that contribute to the success of the Ohio to Erie Trail and who can provide you with additional information regarding their areas.